1 ONLY vintage DECK ROPE PULLEY BLOCK BOAT SHIP BRASS TACKLE clothes airier. 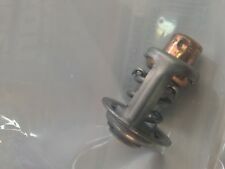 EVINRUDE/JOHNSON OMC 5001036 Thermostat SAME DAY SHIPPING!! Holzstempel mit Kissen. 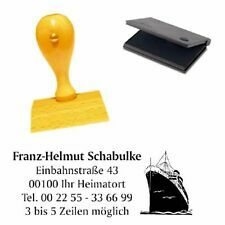 Stempel mit Motiv inkl. Für Kapitäne, Matrosen oder Redereien. « DAMPFSCHIFF ». lackiertes Buchenholz. 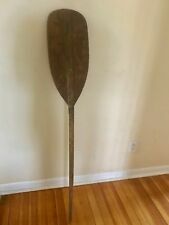 Primitive 54" Antique Boat Oar/Paddle - Nice Seasoned Wood - Great Functional or Display Piece. Unusually large Paddle.9.5" Wide. The purpose of International Signal Code Flags is to be able to communicate with other vessels to provide safety and communication between other boaters. 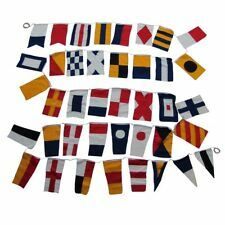 This set of Nautical Flags are a complete Set of 40 High-Quality, Hand-Sewn Flags. 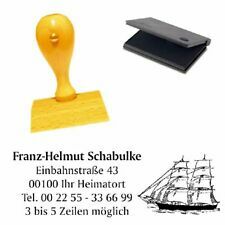 Holzstempel mit Kissen. Stempel mit Motiv inkl. « SEGELSCHIFF ». lackiertes Buchenholz. 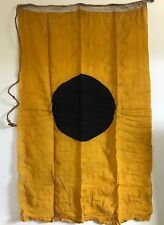 Antique Sewn Linen Gold & Blue US Yacht Flag & With Old 'I' Marking. ~ Early 1900s. Great Looking Flag. Rope with Wood Handle. CLYDE DOCKS, GLASGOW-PLAN FOR GRAVING DOCK. Folded chart with multiple folds. Printed one side only. Suit able for framing. CLYDE DOCKS, PLAN OF HARBOUR OF GLASGOW WITH 1840-46 PLANS. Folded chart with multiple folds. Printed one side only. Suit able for framing. This item has a loop on the back so it can be used as a pendant. The item is new and is in excellent condition. 1.5 by 0.9. En bronze, signée par Darby, La Estancia de la Buries Markes Ltd, lancé le 28 novembre1959, diamètre 45mm, 51g. En bronze, signée par Darby, La Primavera de la Flower Line Ltd, lancé le 9 avril 1960, diamètre 45mm, 51g. I have seen copies of this badge and smaller variations which must have been for guests or souvenirs?. Larchmont Race Week. Special Regatta July 21st 1899. This trophy is Sterling Silver. weight just over 16 regular ounces. 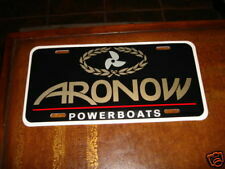 The tray has raised logo of the Yacht Club and also raised details regarding the actual race and the winner. CLYDE DOCKS, GLASGOW, PROPOSED GRAVING DOCKS. Folded chart with multiple folds. Printed one side only. Suit able for framing. Médaille en bronze, signée par G.GONDARD, diamètre: 70mm, poids 92.5g. Inventory Number 6402. The bore is 1". Good condition for its age with moderate to severe nicks on the blades, see pictures. HINGE SWINGS NICE AND FREELY. REST OF THE WORLD £12.95. This compass is in exceptionally great condition. particularly during peak periods. An antique Georgian print. "Key to the Portraits in the Great Picture Of Lord Howe's Victory. En bronze diamètre 68mm, poids 137.8g. Qui vive ?. Médaille en bronze, diamètre 68mm, poids 162.2g. TBE. En bronze diamètre 72mm, poids 187.4g. Made of Linen. Rare Size & Great Colors. Braided Rope & Handle. Excellent ( Ex.). No obvious flaws. Just about in a collectable state. Good (G) Noticeable defects, handling and wear apparent. Poor (P) Incomplete, image seriously affected. A gap filler only! Very Good ( VG ) Minor defects such as album marks, signs of age and handling, acceptable and do not detract from a visually pleasing card. Excellent ( Ex.). No obvious flaws. Good (G) Noticeable defects, handling and wear apparent. Poor (P) Incomplete, image seriously affected. A gap filler only! Very Good ( VG ) Minor defects such as album marks, signs of age and handling, acceptable and do not detract from a visually pleasing card. Nice card little tatty as seen. Excellent ( Ex.). No obvious flaws. Just about in a collectable state. Good (G) Noticeable defects, handling and wear apparent. Poor (P) Incomplete, image seriously affected. A gap filler only! If there's a problem with your order get in touch. And is 1½" in length from the top of the loop, to the base of the compass. This compass features a flip top lid ( operated by the pin shown in the top loop), to open and close it. Antique collectable magnetic compass very nice for marine gift. Excellent ( Ex.). No obvious flaws. Good (G) Noticeable defects, handling and wear apparent. Poor (P) Incomplete, image seriously affected. A gap filler only! Dated December 18, 1883. Size = 7" X 3.". Cancel punch out and a slight bleed through of a blob of ink from the bank near the vignette, in great condition overall. Listed as sailing out of Bedford, Mass. In excellent condition. This was in September 14, 1871 at the Alaska outer continental shelf in the Chukchi Sea at Point Belcher near Wainright Inlet. Sie können hier einen Werbeprospekt erwerben Zweimannkielboot Henze D YAS – vermutlich von 2006/2007. · Henze D YAS. Prospekt mit 4 Seiten - Deutsche Ausgabe. Ohne / without. PL Tutaj kupisz broszur - wysyłka do wszystkich krajów. CLYDE DOCKS, GLASGOW, SKETCH OF FLOATING GRAVING DOCK. Folded chart with multiple folds. Printed one side only. Suit able for framing. CLYDE DOCKS, GLASGOW-PROGRESS OF QUAYS IN HARBOUR, TABLE OF CHANGES. Folded chart with multiple folds. Printed one side only. Suit able for framing. Sie können hier einen Werbeprospekt erwerben · Flying Cruiser Jolle. BWC Flying Cruiser – vermutlich von ca. 2005 (Segelboote, Segeljollen). Prospekt mit 8 Seiten - Deutsche Ausgabe. Brochure with 8 pages - German edition. RARE ANTIQUE PHOTO SAILOR SMS HOHENZOLLERN GERMANY Royal Yacht Service LOOK!